Sure, we can all hate Microsoft. There's so much they do that annoys us. But let's face it - they make the products that make most of our computers go. XP was a great operating system (is still for Netbooks), Vista - for all the complaints - is even better if you turn off "User Account Control" and stop it from indexing everything. I think Windows7 - as bloated as it will be - will be better still. And Microsoft Office is the standard. Yes, OpenOffice copies it well, but Word, Excel, OneNote - these are fantastic applications - and applications which are incredibly easy to use with all kinds of accessibility applications. And, chances are, your school has already bought and paid for Microsoft Office. It is there, waiting for you to make it better. And now, we have new ways to make Microsoft Word much more powerful, with two free add-ons - the newest version of WordTalk and the new Ghotit plug-in. But these new systems, these can make huge differences for virtually every student. But WordTalk also supports writing. When writers hear their words read back to them they recognize problems in ways they simply can not while reading print. They hear misspellings, they hear repeated and missing words. They hear repetitive words. They hear issues with rhythm, even issues with description. And WordTalk, when combined with AutoCorrect shortcuts, even creates an elementary AAC device. Build key short-cuts for phrases, and WordTalk turns Word into a speech synthesizer. 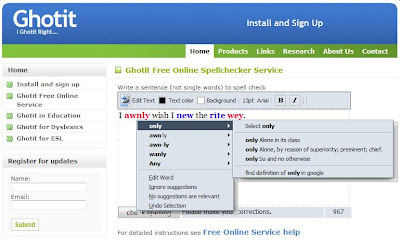 Ghotit adds another powerful tool - context-based spell checking with definition-support and text-to-speech access. Adding Ghotit to Word changes the spellcheck experience completely. No longer do you have to be "very close" with your initial spelling. You can be way off and, chances are, Ghotit will find the right word. And then Ghotit will give you a list of word choices - with definitions. It will read those choices and definitions to you. And not misspelled words - but misused words as well, it notes words "out of context" (in a different color) and offers the same choices. So it is not just correcting spelling, it is building knowledge of the English language. When Ghotit is in use, students begin to show more confidence in their writing, they begin to take more chances with an expanded vocabulary, because they know they are less likely to look foolish - to fail in spelling - to use the wrong words. There is a simple fact: Just as there should not be a school (or university) computer anywhere without Firefox with Click-Speak and Accessibar installed, there should not be a Windows/Office equipped school computer without WordTalk and Ghotit installed. These are free solutions which allow schools to meet some of their civil rights obligations under US and EU laws. They are a basic move toward making educational success possible for a wide group of students currently "left behind." And they are a first step toward bringing a school in line with Universal Design. To not have these software systems available everywhere is nothing less than educational malpractice. Thanks Ira, So True. These tools ned to be on all computers. There are so many free tools available now - there is no excuse! I couldn't agree more. Are you aware of a speech to text program that could be used by elementary students? It would have to recognize voices without training on reading text. We are using WordTalk with students with great success. In true Universal Design fashion this tool benefits all - The teachers use it to proofread report cards and are catching far more errors. I hadn't heard of Ghotit but am downloading it right now. Thanks!